Ladies and gentlemen, we have a cucumber! This was great cause for celebration on Saturday afternoon at the garden. Because we didn’t care for our vine plants properly (hence the Wild West title for that part of the garden), they’ve only managed to become a tangled mess of cucumber and watermelon vines intertwined with fallen peas and lima beans and a wayward Juliet tomato plant. We kind of gave up on that section, chalking it up to our rookie year (and a little bit of laziness for not building a little vining contraption sooner). So, when we were digging around looking for red Juliets, I came across the little guy above and shouted, “LOOK! A CUCUMBER!! !” Thankfully, we were the only ones at the garden, because I’m pretty sure I sounded like a crazy woman…but if you can’t get excited about growing a vegetable, what can you get excited about? 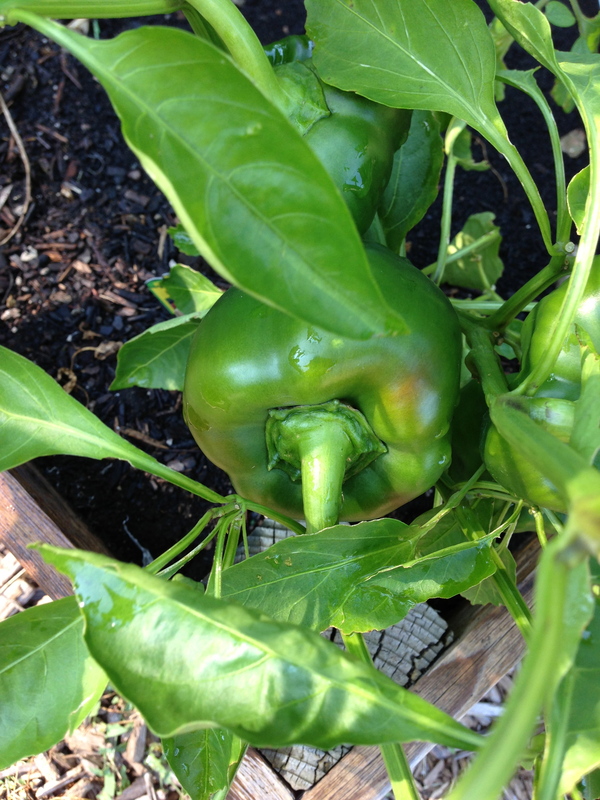 In other good gardening news, our red pepper is getting bigger and starting to turn red. It’s often overshadowed in the garden by the crazy tomatoes, so I’m glad it’s plodding right along to redness. 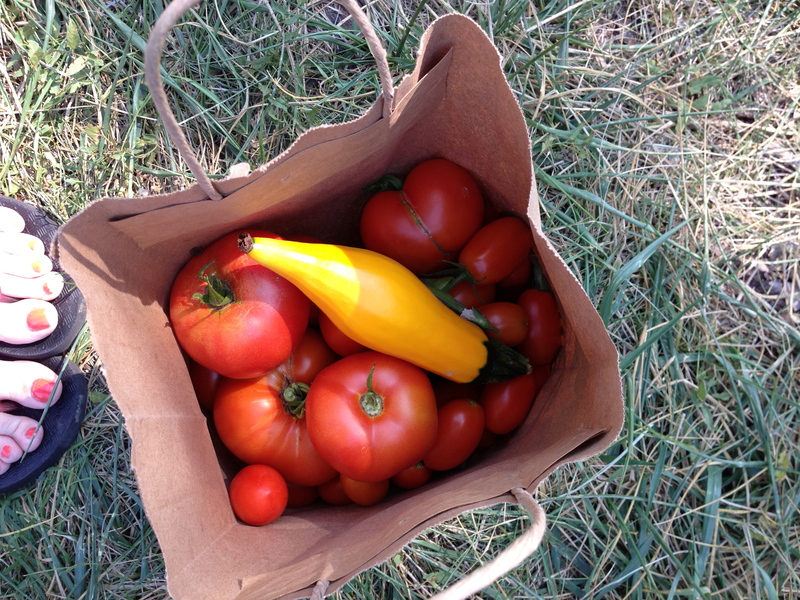 While Naoto weeded, I harvested another large bag of tomatoes (along with a yellow squash from Haig). I gave a few pounds to the book club ladies on Saturday morning, and by Saturday afternoon, our kitchen counter was full again. I just chopped my cuke plant back because I thought it wasn’t doing anything. 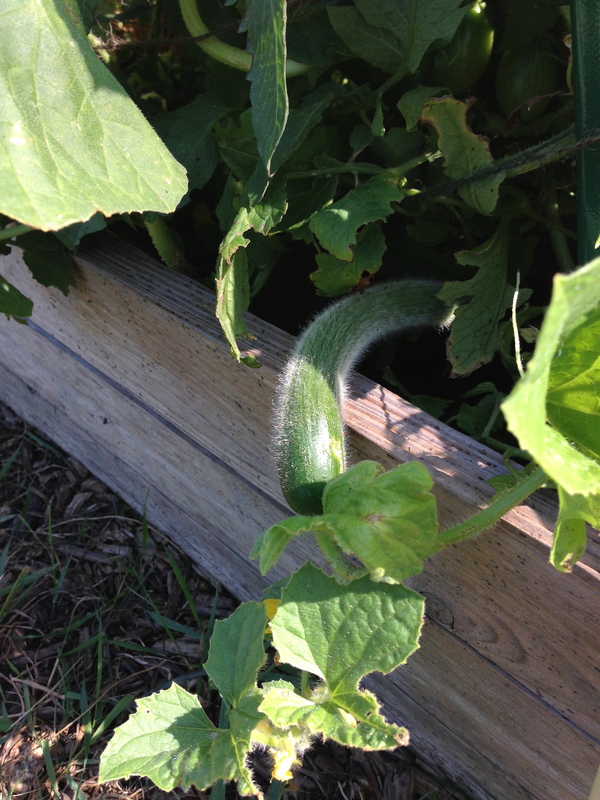 But there it was, hidden by a tomato plant, one lone cucumber. Never had such an unproductive cucumber plant. Unfortunately, it’s too late. I only discovered the cucumber when I was cutting the plant down – oops. I’m used to lemon cucumbers that just produce like crazy! Good luck with your garden. Can’t wait to eat it!